The university at Ramallah campus celebrated the acceptance of the first batch of Ph.D students in business the first of its kind in Palestine with the joint cooperation of Indiana University , Pennsylvania – USA. 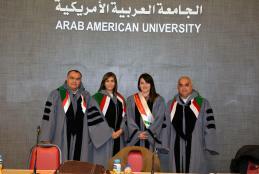 The ceremony was sponsored by the Prime Minister – Designate of the State of Palestine Dr. Mohammad Ashtayyeh. The ceremony of handing over the acceptance letters in the doctoral program was attended by the Chairman of the Board of Directors Dr. Yousef Asfour, the President of the University Prof. Ali Zidan Abu Zuhri, the Dean of Faculty of Graduate Studies Dr. Abdul Rahman Abu Libdeh, the Academic Adviser Prof. Walid Deib, members of the Board Mrs. Sabah Asfour, Mr. Osaid Asfour, Mr. Bahaa Asfour, and former Minister of Education and Higher Education Dr. Khawla Al-Shakhshir, the former University President Prof. Dr. Mahmoud Abu Mwais, the VP for Administrative and Financial Affairs, Mr.